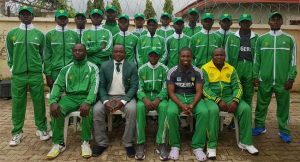 Team Nigeria has beaten Zambia to record a first victory at the Africa’s second division of the 2016 ICC U-19 Cricket World Cup Qualifier in Johannesburg, South Africa. Nigeria won the toss and chose to field first. Zambia went on to bat and scored a total of 150 runs all out in 37 overs with M.A Ali scoring a total of 61 runs for the Zambians. The Nigerian Bowlers responded with some brilliant spells from Captain Okpe Sylvester with three wickets and Isaac Danladi also with three wickets. However, the star performer in the bowling effort for Nigeria was Chima Akachukwu with five wickets. In the second innings, Nigeria’s opening pair of Runsewe Sulaiman and Olaleye Elijah gradually chased the match professionally and eliminated every form of tension with an impressive partnership of 92 runs in 20 overs. Elijah went on to score 69 runs which puts him in a strong position for Man of the match award with Akachukwu strongly in contention. Nigeria scored 151 runs for the loss of two wickets in 32.3 overs and won the match by eight wickets.